Watford assistant coach Ruben Martinez has said he is unsure if manager Oscar Garcia will attend Saturday's Championship trip to Blackburn. Garcia, 41, was discharged from hospital this week after undergoing tests for chest pains. The Spaniard has been back at the club, but has not decided whether he will make the trip to Ewood Park. "I hope so, because he is a help to us, but I don't know for sure," Martinez told BBC Three Counties Radio. "He came to visit Gino [Pozzo Jr, club owner] and Luke [Dowling, sporting director] to speak about his problem. "Everybody is hoping Oscar is coming back in a few days, because he is the gaffer and everyone wants him back as soon as possible." "He wants to come back gradually, but I think in a few days he will be on the pitch." Former Brighton boss Garcia was admitted to hospital on 14 September with minor chest pains, and left 10 days later after a series of tests. 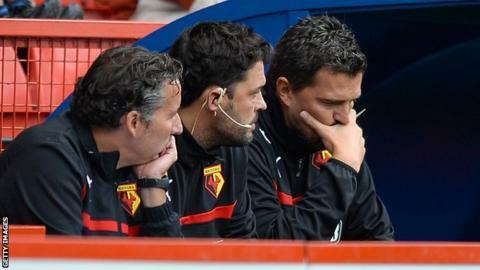 He had taken charge of just one game since replacing Beppe Sannino at Vicarage Road - a 1-0 loss to Charlton - and Martinez and fellow coach Javier Pereira have gone on to oversee a 1-0 win at Blackpool and a 1-1 draw with Bournemouth. "He had a lot of tests, because the problem is his heart - it's not like a leg or anything," said Martinez. "Now all the doctors say he is OK. I've spoken to him and he says he wants to come as soon as possible because he loves his job.